In a small pot, cover the lentils with 2 inches of water and bring to a boil. Add 1/4 teaspoon of salt and simmer the lentils over moderate heat until they are tender, 25 to 30 minutes. Drain the lentils, rinse with cold water and then drain again. Meanwhile, in a large skillet, cook the bacon over moderate heat, stirring occasionally, until crispy. Using a slotted spoon, transfer the bacon to a paper towellined plate. In a small bowl, whisk the oil with the lemon juice; season with salt and pepper. 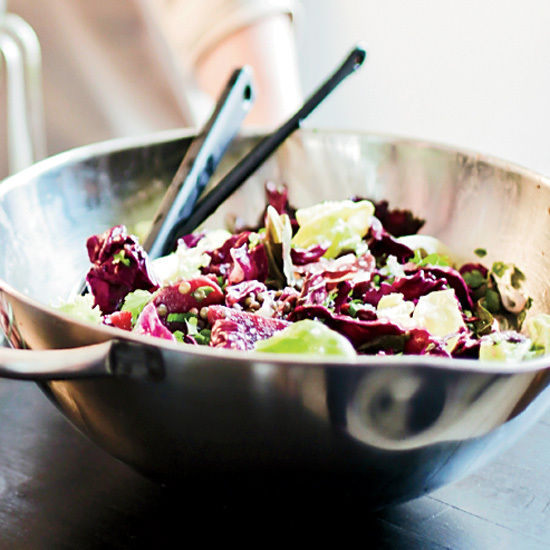 In a large bowl, toss the beets, parsley and lentils with one-third of the dressing. Add the cabbage, lettuce and the remaining dressing and toss gently. Season the salad with salt and pepper, top with the bacon and blue cheese and serve.